Shopping for Star Wars Vehicles? Amazing intergalacitc Attack Shuttle vehicle opens up with tons of battle stations and firing weapons! Firing rockets, rifle racks, troop transports, detachable mini vehicle, sounds, voices, and so much more! 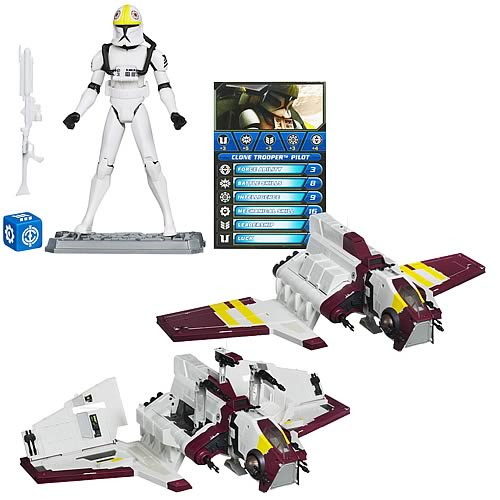 Vehicle comes with 5 projectiles, a unique Clone Pilot Figure, a blaster, and more! Prepare for twice the out-of-this-world battle action! This detailed Republic Attack Shuttle Vehicle features rotating wings to start it "soaring." Put your Clone Pilot Figure in the cockpit and then detach it to create a recon-fighter vehicle! If an attack begins and you've got to arm yourself for battle, convert your vehicle to armored attack-base mode. Electronic lights flash as the base makes announcements like "Droid fighters… incoming!" and "All cannons fire!" to prepare you and your Clone Pilot Figure. Get your enemies in your sights and engage your pop-up missile-firing cannons. None of your opponents have a chance against you and this dual-mode dynamo! The Republic Attack Shuttle Vehicle comes with 5 projectiles, Clone Pilot Figure, blaster, label sheet, instructions, Galactic Battle Game dueling card, battle game base, and game die. Parents and collectors, take note: The Clone Pilot includes a unique white blaster rifle, which is not packaged in the baggie with the rockets, display stand, and other accessories. The gun is stored in a gun rack inside the wing, so be sure to check for it there! In space or on the ground, the Republic Attack Shuttle demolishes the droid army. In attack-ship mode, this heavily armed vehicle pummels the enemy with laser-cannon fire. It lands in the center of the battle and converts to an armored attack base with a recon fighter. Clone Trooper forces operate the attack ship and armored base, using this powerful weapon to bring the battle right to the droid army!